A dietitian once said: "There are no bad foods, only bad diets." I always thought that was a good, common-sense perspective. However, some nutrients and ingredients deserve special attention because consuming too much of them does indeed lead to health problems. One example is trans fats (also known as partially hydrogenated oils). Another example is corn syrup with artificially-boosted amounts of fructose: "high-fructose corn syrup" (HFCS). Because HFCS has been added to thousands of food products, it's likely that every one of us consumes HFCS every single day. Research published during the past 5-10 years suggests that HFCS may be one of the worst "nutrients" you can consume. In fact, the Center for Science in the Public Interest (CSPI) feels so strongly about the health risks of HFCS that, in July 2005, they petitioned the FDA to require warning labels on soda pop. But how can HFCS be bad for us? After all, fructose occurs naturally in honey and many fruits such as bananas, dates, nectarines, and peaches. Answer: It turns out that the fructose in HFCS has different metabolic and health effects than the fructose that occurs naturally in fruits. In this review, I'll explain this and summarize some of the research on fructose and its health effects. I don't want to make this discussion overly scientific, however, there are several biochemistry details that need to be pointed out. Note that fructose is also a component of sucrose, which we know by the common name "table sugar." Fructose is the sweetest of all the sugars. Sucrose (ordinary table sugar) is arbitrarily given a sweetness rating of "100." The sweetness rating of fructose is 170. This explains why honey is so sweet and why even small amounts of high-fructose corn syrup (HFCS) in a food product can make that item taste sweet. Food manufacturers have been increasing the amount of fructose in corn syrup in ever higher concentrations. Today, when you see "high fructose corn syrup" on a food label, you are consuming corn syrup that has 42-55% fructose (see table below). Sucrose (table sugar) is a combination of [glucose] + [fructose] in a 50:50 ratio. So, both HFCS and sucrose contain roughly the same amount of fructose. The fructose in table sugar is bound to glucose, whereas the other 4 examples in the table below represent free (unbound) fructose. Does this matter? There is currently a debate in the nutrition community as to whether "free" fructose (as found in HFCS) is worse for your health than the fructose that is found in sugar (Bray G, et al. 2004a) (Tan D, et al. 2008). Nutrition researchers at Rutgers University in New Jersey have reported that a single can of carbonated soda pop contains 5 times the concentration of a specific damaging chemical ("methylglyoxal") than is found in the blood stream of the typical diabetic person (Tan D, et al. 2008). They believe these molecules are related to the free fructose found in HFCS. However, Havel and colleagues showed that free fructose (eg., HFCS) and bound fructose (eg., sucrose) increased triglycerides to the same degree (Stanhope KL, et al. 2008). So, deciding whether free fructose is worse than bound fructose depends on which health complication you choose to look at. From a chemical perspective, fructose truly is unique....even among monosaccharides: glucose and galactose are "aldoses" whereas fructose is a "ketose". This minor, but significant, chemical distinction may explain why fructose's actions on the body are so unique. But start inspecting the Ingredients list on food labels: HFCS is in thousands of processed food items! For some unknown reason, the hormonal response to dietary fructose differs from the response to other simple sugars. Normally, when blood glucose goes up, a signal is sent to the pancreas to release insulin. Insulin, in turn, stimulates the release of another hormone known as leptin. And leptin suppresses a 3rd hormone known as ghrelin. It is thought that this hormonal domino effect is one of the ways the sensation of hunger is suppressed in the brain. Researchers gave healthy adults an equivalent dose of 3 sugar solutions: (a) 100% glucose, (b) a 50:50 mixture of glucose and fructose, and (c) a 25:75 mixture of glucose and fructose. Insulin output was lower after both glucose:fructose mixtures compared to the 100% glucose solution (Parks EJ, et al. 2008). Fructose did not stimulate insulin output as strongly as glucose did. Translation: If fructose does not stimulate the "stop eating" signal as readily as other carbs, then, it's possible that people will consume more calories before they feel full. Diets that are high in carbohydrates (defined as >55% of energy intake coming from carbs) tend to increase triglyceride levels in the blood (Parks EJ. 2001). 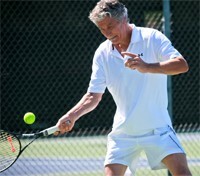 This action occurs regardless of the type of carbohydrate ingested. But the process of lipogenesis (ie., the synthesis of fat cells) can be as much as 2-fold greater after consuming fructose than after consuming glucose (Krilanovich NJ. 2004) (Parks EJ, et al. 2008) (Stanhope KL, et al. 2008). "...ingestion of large quantities of fructose has profound metabolic consequences because it bypasses the regulatory step catalyzed by phosphofructokinase. This allows fructose to flood the pathways in the liver, leading to enhanced fatty acid synthesis, increased esterification of fatty acids, and increased VLDL secretion, which may raise serum triacylglycerols and ultimately raise LDL cholesterol concentrations." Translation: Fructose stimulates fat synthesis in the liver and worsens the lipid profile in the bloodstream. Both actions are not good for your health! Starting in late 2005, nephrologists at the University of Florida began reporting that fructose can increase uric acid levels (Nakagawa T, et al. 2005) (Nakagawa T, et al. 2006). Elevations in uric acid can lead to kidney stones. But, these researchers also found that high uric acid levels reduced nitric oxide levels. This, in turn, contributes to insulin resistance and a serious medical condition known as "metabolic syndrome" (see discussion below). Then, in 2007, the Florida nephrologists reported that fructose -- but not glucose -- accelerated the progression of kidney disease (Gersch MS, et al. 2007). However, up to this point, all of this research was conducted in rats. In January 2008, researchers from Harvard reported that fructose consumption increased the incidence of kidney stones in both men and women as well (Taylor EN, et al. 2008). Translation: Fructose has detrimental effects on kidney function, which, in turn, can lead to other health problems. So what are the long-term health consequences of these metabolic actions of fructose? Keep in mind, the research discussed above showing that fructose stimulates fat synthesis is not proof that fructose causes obesity. Weight gain, ultimately, requires consuming more calories than you burn up. So, is weight gain and obesity due to eating too many carbs in general, or, is it due to the specific types of carbohydrates in the diet? "Over the last 30 years, the per capita consumption of sugar — sucrose — has gone down from 72 pounds per person to 45 pounds per person a year. If sugar intake has gone down, then it's not as a significant contributing factor to the obesity issue as some people have made it out to be." The statement from Briscoe above needs to be kept in perspective. Some researchers point the finger at high-fructose corn syrup (HFCS) as one of the main causes of the obesity epidemic in the US (Bray GA, et al. 2004b). Over the past 15-20 years, a large percent of the sugar (sucrose) used as a sweetener in food products has been replaced with high-fructose corn syrup (HFCS). The use of HFCS containing 42% fructose began in 1970; the use of HFCS containing 55% fructose began around 1980. Between 1970 and 2000 there has been a gradual decrease in the use of HFCS-42 and a gradual increase in the consumption of HFCS-55. Most brands of soda pop are sweetened with HFCS-55. Consumption of soft drinks, though it has leveled-off and even declined recently, is still in the range of 50 gallons per person per year. Yet, even if consumers switch to fruit drinks, often the sweetener in these beverages is also HFCS. Some brands of fruit-flavored iced tea are also sweetened with HFCS! When the incidence of obesity and the consumption of HFCS in the US are plotted together on a graph, a very troubling pattern emerges: There is a noticeable increase in the incidence of obesity in the US starting in the early 1980s (Bray GA, et al. 2004-b). So, while Briscoe may be correct that our consumption of table sugar has leveled off, or even decreased, our consumption of HFCS has increased. And so has obesity. The problem, I feel, is that so many food products contain HFCS. Even if you don't drink soda pop, you are still ingesting HFCS in small amounts from a variety of foods, perhaps every single day. Look closely at food labels: you will see HFCS in ketchup, tomato sauces, chocolate milk, and even multi-grain breads. Considering that fructose can (a) suppress the signal in the brain to stop eating, and (b) induce fat synthesis, I believe people struggling to lose weight should carefully evaluate the foods they are eating and look not only for the total calorie count, but, also, if it contains HFCS. Fructose increases triglyceride levels (Havel PJ. 2005). And there is evidence that this process is worse in people with insulin resistance (Abraha A, et al. 1998). Insulin resistance means that the actions of insulin are less effective, and this occurs in people who are obese or who have a condition known as "metabolic syndrome." 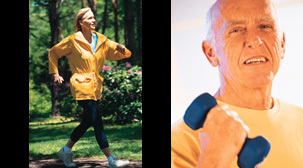 Currently, 23% of the adult population has metabolic syndrome (NHANES data 2009-2010, Benjamin EJ, et al. 2017). These people should be especially diligent about reducing their consumption of foods sweetened with HFCS and/or sugar. Way back in 1971, a small study had people consume 20 servings of fruit per day for 12-24 weeks. It was estimated that these subjects consumed about 200 grams of fructose per day. Yet, despite this high intake, no worsening of body weight, blood glucose, insulin levels, or lipid levels were seen! (Meyer BG, et al. 1971) (Ludwig DS. 2013). So, don't worry about the fructose that occurs naturally in fruit. However, canned fruit in heavy syrup may contain lots of added sugars. So, minimize your consumption of canned fruit. Eat fruit in its natural state. 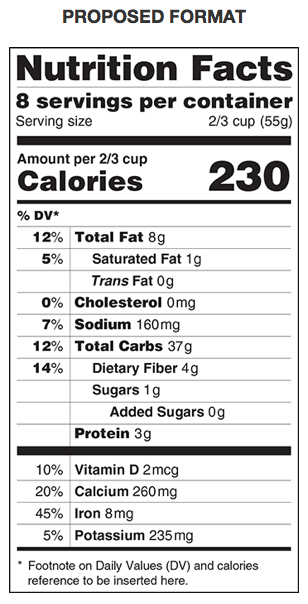 The "Nutrition Facts" panel on packaged foods in the US provides some useful information. The FDA mandated new changes to the standard format (seen in the image to the right). The deadline for compliance is January 2020 for food manufacturers with sales of $10 million or more. The deadline for smaller manufacturers is January 2021. "Total Carbs" are listed. As before, this is the amount of all carbohydrates. A specific line for "Sugars" (in the image, "1 g") is new, however, this represents all types of sugars in the food item. How much HFCS does this item contain? At the bottom of the panel (not shown here), there is a section called "Ingredients." Here is where HFCS would be listed. However specific amounts are not provided in this section of the label either. Thus, it's still not possible to calculate the actual amount of HFCS in a specific food product from the information that currently appears on food labels. • "Fat Free" items: In the process of removing fat, food manufacturers have added various types of sugars to maintain an appealing taste. Look closely at the Ingredients list. "Fat Free" half-and-half, "Fat Free" ranch dressing...these food products contain HFCS. • Maple Syrup vs. Pancake Syrup: "Maple" syrup and "pancake" syrup are not the same. Maple syrup is 90-95% sucrose, whereas imitation maple syrup is sweetened with HFCS. In that case, in the US, manufacturers are prohibited from calling it maple syrup and use names such as "pancake" syrup. Most consumers probably assume that "maple" syrup and "pancake" syrup are similar. Knowing the amount of HFCS in each would help differentiate them. • Fig Newtons: The label for Nabisco's Fig Newtons (as of June 2018) clearly states "No High Fructose Corn Syrup." However, if you look closely at the Ingredients list, "corn syrup" is listed. Playing games with names just confuses consumers. Labels should report the specific number of grams of fructose when a food item contains that sugar. • Inspect the Ingredients List on all Packaged Foods: Due to the negative publicity of high-fructose corn syrup, food manufacturers may not list it by that name on food labels. 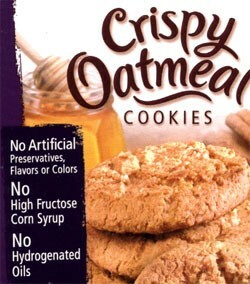 As in the example of Nabisco's Fig Newtons, "corn syrup" is listed instead. There are many other names for sugar, too: cane syrup, agave syrup, etc., etc. You'll have to be diligent to avoid, or minimize, these products. • Be Wary of "Fat-Free" Foods: Many fat-free foods replace the fat with sugar. • Stop Drinking Soda Pop: Trust me when I tell you that the caffeine in soda pop is the least of your concerns. Soda pop is sweetened with HFCS-55 (corn syrup with 55% added fructose). • Don't Worry About the Fructose in Fruits: Don't worry about the fructose that occurs naturally in fruit. However, minimize your consumption of canned fruit in "heavy syrup." Fructose, it seems, is the worst carbohydrate of all. It causes very unique and puzzling metabolic effects, and these actions, in turn, contribute to obesity, lipid disorders, and metabolic syndrome. Be judicious about reading food labels, and avoid products containing high-fructose corn syrup as much as you can. But, good luck with that! As I mentioned, HFCS is now in thousands of processed food products. Q: Sports drinks such as Gatorade® and Powerade® contain fructose. Should I stop drinking them? ANSWER: Not exercising regularly is a LOT worse than consuming the relatively small amounts of fructose from sports drinks! When laboratory rats were fed a high-fructose diet and not allowed to run, in as little as 2 weeks their blood pressure increased and metabolic changes were seen. However, in rats that were allowed to run, the effects of the high-fructose diet were minimized (Reaven GM, et al. 1988). Keep in mind that the amount of fructose from sports drinks is a lot less than from soda-pop or apple juice. Also, note that the use of simple sugars (such as glucose and fructose) in combination has been found to be the optimum formula for fueling your body during exercise. "Simple" carbohydrates are absorbed more readily from the GI tract than complex carbs, and, using several simple carbs together (in a sports drink) also allows for more efficient absorption as compared to a solution containing only a single carbohydrate. Nevertheless, even if you exercise regularly, it is still smart to minimize the amount of HFCS-containing products you consume. But, until they come up with something better, don't worry about sports drinks that contain "glucose-fructose syrup"....just get out there and exercise 5-7 days per week! The best web site for information on glycemic index and glycemic load is www.GlycemicIndex.com, maintained by the University of Sydney. Unfortunately, the glycemic index value for most manufactured food products has not yet been determined. 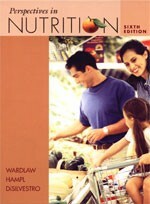 Although it is intended to be an academic text, "Perspectives In Nutrition" (by Wardlaw, Hampl, and DiSilvestro) is a nutrition book that most consumers could use. The information is written in easy to understand language, and, the multitude of colorful diagrams, tables, and pictures help to explain the concepts. The Appendix alone is 203 pages! Read our review.